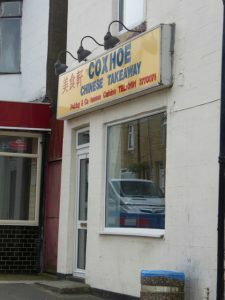 Coxhoe Chinese Take Away is a locally run food business. Grace and her team are pleased to offer a wide range of Peking and Cantonese Cuisine as well as traditional English dishes. With over 200 things to choose from on their menu you cannot be stuck for choice. Grace is extremely friendly and welcoming. Grace does not have a delivery service but why not phone your order in and then pick it up to save you time. The Take Away is open every night of the week apart from Tuesday and is open all Bank Holidays.